Like my spoiler from x- Mas Swap Anja and Tsea I took part in the Knitters Treat Exchange too. This Swap was hosted by my Secret Pal9 spoilee Isobel and sweensie and the aim was to spoil another knitter. One should send yarn for a small project, a magazine, something pampering and a delicious treat and some small assecoires. 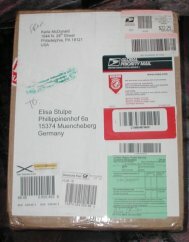 Since the 5th of May I have been waiting for my parcel and now today my postwoman finally arrived with it. "You have mail from Pennsylvania!" , she said and I immediately understood what it must be. It also became obvious, why it had taken so long. From upstairs, looking out of the window, I first thought it must be something from Amazon and I found it very weird, why I should recieve a package from amazon since I hadn´t ordered anything. I was able to controll myself and keep the parcel closed for quite a long time, because I used it as an extra motivation to finish my daily (and not so daily) tasks, one of which it was to iron Rons longsleeved business shirts with an outside temperature of 31 degrees celsius. jeez. To make sure I have a photo in case I loose controll early, I first took a photo and then went on with work. Finally the best about it could take part: the unwrapping. 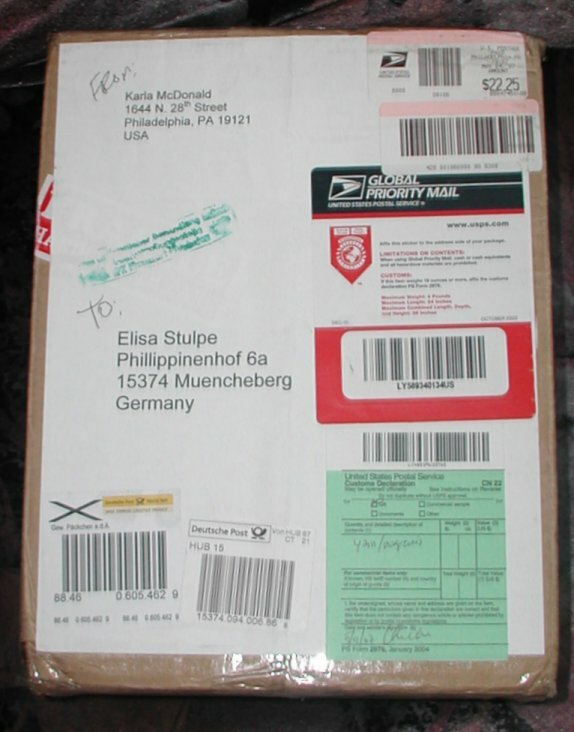 My spoiler was the nice Karla from the beautiful Pennsylvania, who really put lots of thoughts and efford into the parcel. Ok, my questionaire was very clear and my wishlist too, but she also put a lot of other ideas into it. 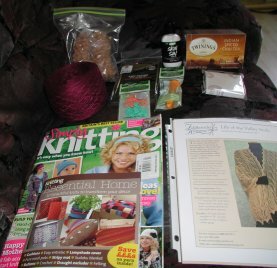 I recieved my beloved Simply Knitting (which is published in Great Brittain, in other words had to cross the Atlantic ocean twice which surely made it even more expensive ) which had a little pattern booklet with home assecoires as a free gift. One of the patterns is from a person I quite admire and have personal contact with, Claire from missbell.uk. The parcel also contained a noteblock that sticks and has a cool pattern, locking stitch markers and a chibi needle case from Clover from Japan. I´ve had them on my wishlist since the start of Secret Pal 9 last year and put them on because I´had seen them in an issue of Simply Knitting. But the best in the parcel were a lace needle from addi turbos which measures 1,50metres and is 3,5mm strong. And above all this incredible yarn. The yarn is a Laceweight Merino - Tussah silk blend and just "my" shade of darkred. It is the thinnest yarn I´ve ever had and is wound up in a unusual form, which I´ve seen at several irish knitter´s blogs and at Theresias but it´s my first one in this shape. Karla had the idea of me knitting the lace shawl from the pattern with the needle and the yarn (in her accompaning letter she gave me several advices for lace knitting) but this pattern really isn´t just my taste. But I think the idea itself was nice and so at least I am going to knit some lacy toe socks from this beautiful yarn with the pattern from a November Simply Knitting issue, which I have also sent to Tsea. I think the yarn is nice for the toes and not too thick and apart from that it is very smooth and comfy and with that silk content it is ideal for summer. I have asked my friend Yaga from Switzerland a favour, she is going to buy some less than 2mm dpns for me. I very much appreciate that, because I bet that those needles will suit that Laceweight yarn better. Thank you dear Karla for this great goodies, everything absolutely suits my taste, and the cookies too, don´t worry. Thanks also to Isobel for her caring guidance and the immense efford she put into this swap. I am going to take part in the second round around October too.